Plants are complex, and they have profound effects on the human body. Paracelsus said, “What is there that is not poison? All things are poison and nothing is without poison. Solely the dose determines that a thing is not a poison” (Grandjean, 2016). For the herbalist, knowing how to use low-dose botanicals without causing harm is of utmost importance. In this article, I will discuss what low-dose botanicals are as well as how to use them. We will specifically look at lobelia (Lobelia inflata) and learn proper ways to use this herb, its preparations, and historical data around its safety. Low-dose herbs are herbs in the materia medica that offer great effect with a smaller intake. Often, this is because of individual constituents within the plant that offer some adverse effects if used in higher dosage. This is no reason to shy away from using low-dose herbs, however, it is important to know how to use them in a safe fashion. When working with low-dose botanicals, it’s important to have your plant identification skills honed. For safety, you need to be careful to not misidentify or mix your low-dose harvest with other plants. Once you are sure you are with the plant you want to work with, use gloves when harvesting and processing your herb. Many plants can be powerful even through the skin, especially if there is an open cut present. If purchasing dried forms of low-dose botanicals, it’s important to find reputable and trustworthy suppliers who offer high-quality products. Some great options are Mountain Rose Herbs, Pacific Botanicals, and Starwest Botanicals. When processing plant material, it’s a good idea to have a set of tools specific to low-dose plants. Once you are done processing the plant material, make sure to wash your hands and tools thoroughly before using them with another plant (Brounstein, 1996). Labeling is a very important safety piece to working with low-dose botanicals. I recommend putting a large red dot on your low-dose herb bottles and receptacles. You should also write in capital letters: LOW-DOSE. It’s a good idea to store these herbs in their own cabinet, away from your other herb supply, taking special care to keep them away from children and pets. Most low-dose herbs are used with great intention. However, there are some instances when low-dose botanicals are not a good fit. Make sure you need to use a low-dose botanical and have good reasoning behind your choice. Due to the powerful and quick action, using low-dose botanicals are contraindicated during pregnancy and lactation. When it comes to dosing low-dose botanicals, drop dosing is used. Drop dosing is the practice of measuring a dose in drops, rather than milliliters; for low-dose herbs, 1-3 drops of an herbal extract, such as a tincture, is often used for a dosage. There is an old coinage, “The dose makes the poison.” Hormesis is another way to think about low-dose dosage. Hormesis is when a low dose is beneficial while a higher dose is inhibitory (Nagel, 2016). This is a term that is widely used in the toxicology field where low-dose stimulation has a positive effect on the cell or organism due to an “adaptive stress response” (Mattson, 2008). Low-dose herbs also work very well in formulas. When working with a formula, you will want to make sure that you know how much of your low-dose herb will be in the entire formula as well as each dose. For example, I feel lobelia (Lobelia inflata) works very well in allergy formulas when breathing becomes labored. By taking 1 mL (or 30 drops) of an allergy formula three times a day, you will want to make sure you are not exceeding 3 drops of lobelia in each dose, meaning your total daily dose of lobelia would not exceed 9 drops. Another thing to consider when it comes to dosing your low-dose botanical safely is the strength of your ethanol extraction. If working with fresh flowers and seeds, a 1:2 tincture in 95% alcohol is recommended. If working with dried plant material, a 1:5 in 65% alcohol is suggested (Easley & Horne, 2016). If using a 1:5 tincture, a vinegar extraction, or another large ratio tincture (such as a 1:10), you could increase your drop dosage slightly (usually 1 extra drop at each dose). No matter, I would still keep your starting dosage low, beginning around 3-5 drops per dose and titrate up from there. Michael Moore’s herb manuals, found on his website, are a good place to look for dosing instructions for many low-dose botanicals. While it is a good idea to follow the dosing guides provided by experienced herbalists, do remember that starting with a low dose and titrating that dosage up slowly is a good roadmap. Lobelia, a member of the Campanulaceae family, is a great low-dose herb to have in your herb chest or first aid kit. It is commonly known as lobelia but also goes by the names Indian tobacco, puke weed, and asthma root. Lobelia is a warming, dry, and acrid herb. It is relaxing, diffusive, and a strong vital stimulant. Clinically, it is a powerful antispasmodic, respiratory stimulant, expectorant, diaphoretic, diuretic, and emetic (Holmes, 2007). Lobelia can be used internally as well as externally. Internally, it can work to soothe upper respiratory spasms as well as spasms in the gastrointestinal tract. Lobelia opens the chest to help ease wheezing and coughing. Through its expectorant actions, it can help when phlegm is present. During smoking cessation, lobelia can be a great addition to a tincture formula or herbal smoking blend for its expectorant properties and ability to help one deeply relax. Lobelia is supportive of the body’s innate vitality and relaxes tension, soothes pain and spasms, and modulates inflammation. It is supportive to the nervous system during tension and musculoskeletal tissue excitement (Cook, 1869). In acute injury, topically and internally, lobelia can support pain and spasm. If using the tincture topically, be aware that you may feel some nausea at a higher dose when applied close to the spinal column. Lobelia is a safety class 2b herb and should not be used during pregnancy or lactation. In drug interactions, it is a class A herb. This means that no clinical interactions are expected (Gardner & McGuffin, 2013). However, I recommend never suggesting lobelia, or a low-dose herb, without having tried it yourself first. While lobelia’s positive traits are highly valued, it is an herb that quickly demands respect. If used incorrectly, or with too high of a dosage, lobelia can have a strong emetic effect (Skenderi, 2003). Moore states that as long as you stay below any sign of nausea, you will have no problems with this herb. My suggestion is to start low with one drop of lobelia and then assess any effects. Most of my clients will notice the effects between 1-3 drops, some of which may be less labored breathing, muscle relaxation, and gentle expectoration. The United States Food and Drug Administration (FDA) considers lobelia to be a poisonous plant, specifically because of its piperidine alkaloid constituent called lobeline. However, there are no reports in which the herb has caused convulsions, coma, or death (Easley & Horne, 2016). Lobeline is a respiratory stimulant and acts on the nicotinic receptors acting as an antispasmodic bronchodilator in asthma and bronchitis (Ganora, 2009). Lobelia can produce symptoms of a severe nature including nausea, vomiting, and deep relaxation. Lobelia has a natural safety mechanism, the alkaloid isolobinine, contained within it that triggers an emetic response if taken at a high dosage (Holmes, 2006). Supportive actions are more often seen with smaller frequent doses instead of large irregular dosing. Because of the synergy of constituents contained in the whole plant, and not used in isolation, it is hard to assay the toxicity of a plant from the presence of a toxic constituent (Bone & Mills, 2005). Lobelia can be used in the form of a decoction, tincture, infusion, vinegar, gargle, smoke, drawing poultice, compress, and ointment. Typically, the aerial parts of lobelia are used. However, the seeds can also be used. Please proceed with caution when using the seeds as they are twice as strong as the herb, and you will need to reduce your dosage (Cook, 1869) by 50%. There is another interesting thing that can happen with lobelia. If there is a true need, a source of pain, or a tissue in need, sometimes a person can increase their dosage without noticing any of the nausea or emetic properties. Each client is unique and the dosage of lobelia is dependent on that particular person. Again, start low and go slow, but do keep in mind that if someone is in acute pain or having an acute asthma attack, a larger dose may be warranted. If the acute discomforted has not been checked by the initial dose of lobelia, increase the dose by one drop at the next dosage. Continue increasing your dose by one drop until you feel relief. With a physical spasm, putting lobelia tincture directly on the area, topically, would be a good idea. Bastyr liked using 30 drops of lobelia formulated with 10 drops of cayenne for acute asthma. He also emphasized not to use this dosage more than twice (Mitchell, 2003) in one day. I also recommend never offering lobelia, or a low-dose herb, without having tried it yourself first. Lobelia was traditionally paired with cayenne (Capsicum annuum) by herbalist Samuel Thompson. Both herbs are vital stimulants and are fast acting when paired together. Lobelia, a strong relaxant and antispasmodic, and cayenne, a strong circulatory stimulant, both support the quick action of relaxing the body. Tension is a common throughline in our culture and with tension can often come injury, muscle soreness, spasm, and a general inability to relax. Lobelia, having an affinity for the lungs, can allow you to take a deeper breath, relax your muscles and mind, and step up in moments of deep need. These recipes are simple and profound in their effect and may support a more relaxed state. This is a lovely self-care ritual after a long day of sitting or driving. I also find that for moments of tension, sore muscle, and achiness, this can be a welcome pre-bedtime ritual. You may feel very relaxed, and almost jello-like, so be mindful when getting out of your bathtub. Pour hot water over lobelia in a quart jar. Steep lobelia for 30-60 minutes. Pour strained tea into the bath. I find this recipe helpful for specific pain, tension, inflammation, and spasm. Neck and back tension are very common and a lobelia liniment or fomentation can be very soothing to spastic muscles. Steep in rubbing alcohol, vinegar, or water for 30-60 minutes. Strain the herb from the menstruum. Apply to sore muscles as a fomentation or liniment for sore muscles. Bone, K., & Mills, S. (2005). The essential guide to herbal safety. London: Churchill Livingstone. Cook, W. (1869). Physio-medical dispensatory: A treatise on therapeutics, materia medica, and pharmacy in accordance with the principles of physiological medication. Cincinnati, OH: WM H. Cook. Easley, T., & Horne, S. (2016). The modern herbal dispensatory: A medicine-making guide. Berkeley, CA: North Atlantic Books. Ganora, L. (2009). Herbal constituents: Foundations of phytochemistry. Louisville, CO: Herbalchem Press. Gardner, Z., & McGuffin, M. (2013). American herbal products association’s botanical safety handbook. Boca Raton, FL: CRC Press. Holmes, P. (2007). The energetics of Western herbs. A materia medica integrating western & Chinese herbal therapeutics. Cotati, CA: Snow Lotus Press. Mitchell, W. (2003). Plant medicine in practice: Using the teachings of John Bastyr. Seattle, WA: Churchill Livingstone. Moore, M. (2003). Medicinal plants of the mountain west. Santa Fe, NM: Museum of New Mexico Press. Skenderi, G. (2003). Herbal vade mecum. 800 herbs, spices, essential oils, lipids, etc. constituents, properties, uses, and caution. Rutherford, NJ: Herbacy Press. 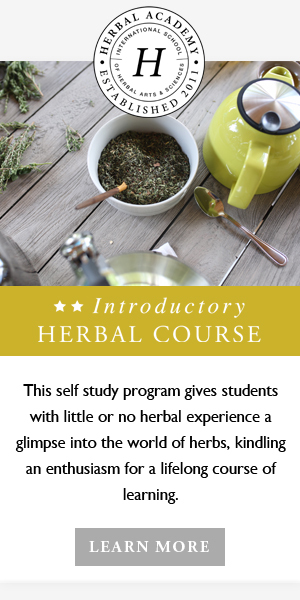 Meghan Pivarnik is a clinical herbalist and flower essence practitioner at the Evergreen Center at the Colorado School of Clinical Herbalism. She runs a clinical practice under the name red fawkes apothecary. As a clinician, she brings in her attention to detail, appreciation of each sense, softness, and deep listening. Meghan is grateful to step into the lineage of holding space for people to find their most vital selves. You can contact her at Meghan.pivarnik@clinicalherbalism.com.